A volcano found naturally in the world. Volcanoes are naturally generated when RedPower 2 is installed. They are useful for the collection of Basalt and Lava. Volcanoes are Basalt formations, that can take the shape of a composite volcano (tall, narrow) or a shield volcano (short, flat). The middle column (1x1) of either type consists of lava, continuing down to a large pool of lava near bedrock. They are a good source of lava for geothermal generators. 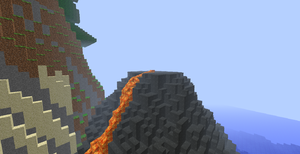 Lava will randomly generate on the surface, sometimes causing forest fires. This page was last modified on 10 March 2019, at 04:16.